Growing to lengths of 8 feet and weighing as much as half a ton, the African lion (Panthera leo) is a powerful and emblematic apex predator of the Serengeti. As the dominant predator in its ecosystem, the lion exerts considerable top-down influence to keep the entire ecosystem in check. Due to habitat destruction and human persecution, fewer than 25,000 lions remain in the wild. The species' continued survival depends in part on an understanding of the crucial role it plays in the savanna ecosystem. Lions and hyenas account for around 85 percent of the predation on the Serengeti's large herbivores, including buffalo, zebras and wildebeests. Thinning the herds of these large animals enables smaller, less dominant herbivores to find enough food to survive. If large herbivore populations went unchecked, both herbivorous and omnivorous animals would have significantly fewer food resources. Lions have special importance as the only predators on the savanna capable of killing Africa's largest herbivores, animals such as elephants and giraffes. Lions prey primarily on herd animals, attacking the herd and focusing on the weakest members that fall behind the herd. 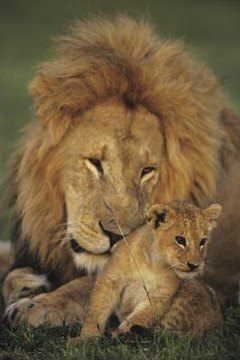 Since herds attempt to protect their young, most animals that fall prey to lions are either very old or sick. Since herd populations are also checked by disease and parasites, predation by lions keeps these herds strong and healthy. Without lions, there would be more animals serving as hosts for parasites and pathogens that would spread throughout the herd, leading to fewer healthy animals. Without the threat of apex predators like lions, smaller carnivores tend to multiply. These animals typically live in large groups. When they proliferate, they cause similar problems for farmers and villagers as the lions did, but their numbers can make them more difficult to control. For example, after a systematic reduction of lions in Ghana, olive baboons became far more prevalent. These mid-sized predators caused significant problems in farms and villages by attacking livestock, damaging crops and spreading intestinal parasites and disease to the villagers. Humans present the greatest threat to the lion's continued survival in the wild. As human development increases, more wild savanna habitat is being destroyed or used for farming or ranching livestock. When a lion kills or threatens a farmer or rancher's livelihood, that individual is likely to poach or poison the lion in retribution. Farmers and ranchers have a greater economic incentive to kill the lion and eliminate further loss of crops and livestock. Conservation groups work with people living in lion territory, educating them about the lion's ecological importance and developing inexpensive ways to protect their livelihood while allowing them to coexist with the big cats. How Big Can a Siberian Tiger Get? What Do Lions Do All Day? How Do Alpacas Keep Other Animals Out of Their Territory? What Are Some Threats to the Siberian Tiger? What Is the Predator of the African Lion? What Animals do Lions in a Savanna Eat?